I’ve been a Physical Therapist for over 7 years. I love helping kids become stronger and more independent. One thing I’ve always been passionate about is shortening the amount of time it takes to help children make progress toward their goals. My best tip? Get them started early! 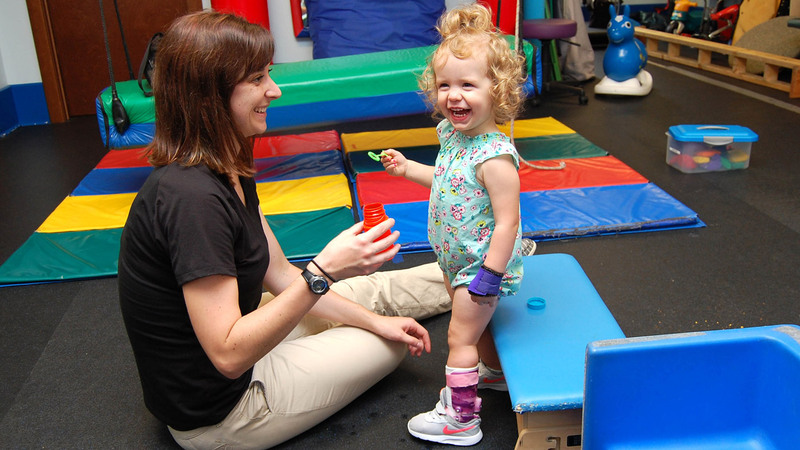 A nine-month-old who only is just a little bit behind developmentally may take as little as a few months to get back on track. If you wait until the child is three years old to address the same concerns, it might take years of therapy to help them overcome the difference. You might know that a baby’s brain is developing at a very fast rate. They are constantly building connections and learning skills. In other words – therapy is more effective because therapists aren’t re-training babies’ neural pathways, we’re helping to build them from the ground up. It can be very difficult for parents to know when it’s time to connect with a professional. Each child develops a little differently from the next. It’s easy to shrug off a delay when a child is making progress in other areas. To help parents keep track of their child’s development, I created a list of milestones to watch for as children grow. If your child is behind in reaching these early milestones, partnering with an expert therapy team can help you determine if there’s an underlying concern to address. Whether your child has a small hurdle or a big journey to face, therapists can help them reach goals and live a great life! If you have questions about your child’s development, contact our team using the form below.